Optional: assorted sprinkles, nuts, coconut, etc. Prepare a baking sheet by lining it with parchment or waxed paper. Melt the chocolate candy coating in a medium bowl in the microwave. Stir after every 30 seconds to prevent overheating. Stir until the coating is melted and smooth. Holding a peep by the head, dip the bottom in the chocolate, covering about 1/2-inch of the bottom of the Peep with chocolate. Let the excess drip back into the bowl before carefully placing it on the baking sheet. 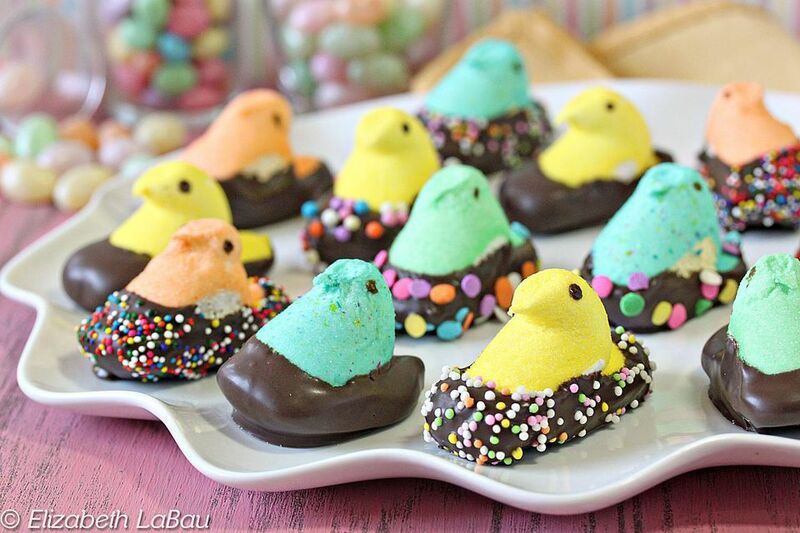 If you want to add sprinkles, nuts, or other decorations, sprinkle them on the Peep while the chocolate is still wet. Repeat until all of the Peeps are decorated. Place the tray in the refrigerator to set the chocolate for 10 minutes. Store chocolate-dipped peeps in an airtight container at room temperature for up to a week. These are best within a few days of when they're made, because the peeps will get chewier the longer they're exposed to air. If you're one of those people who enjoy slightly stale peeps, then these can be kept for weeks!